Mingling the "Cultural Remains of Victims and Perpetrators"
In January 2011, a pair of unique objects turned up in the ancient university town of Tübingen, Germany, when a Christian theology instructor and his wife bought a new apartment, occupied by an elderly, reclusive man. Shortly after the purchase, the man died, and his possessions fell into the hands of the new owners. Among these possessions were two original oil paintings depicting a uniformed Nazi German soldier and his wife. 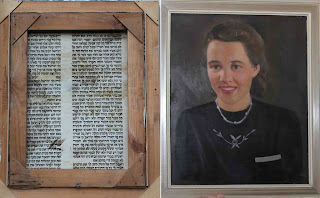 On removing the paintings from the walls, the new owners discovered that these likenesses were painted on the back of sections of Torah scrolls. The texts of the scrolls were perfectly legible. One could clearly read from Sefer Shemot, parshiyot Ki Tissa and Vayakhel (Exodus 34:9-35:16), and from parshiyot Vayakhel and Pekudei (Exodus 37:13-39:6). The paintings depict Alfred Mayer and Hedwig Mayer, the parents of the deceased tenant, Heinrich Mayer. 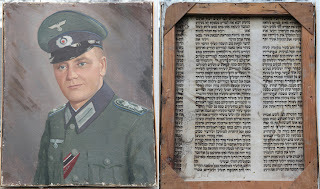 Alfred Mayer was an electrician originally from Stuttgart, who served in the Wehrmacht from fall 1939-spring 1945, attaining the rank of sergeant first class. Formally recognized as a master mechanic, he was decorated with the War Merit Cross for his service on the Soviet front in the winter of 1942. 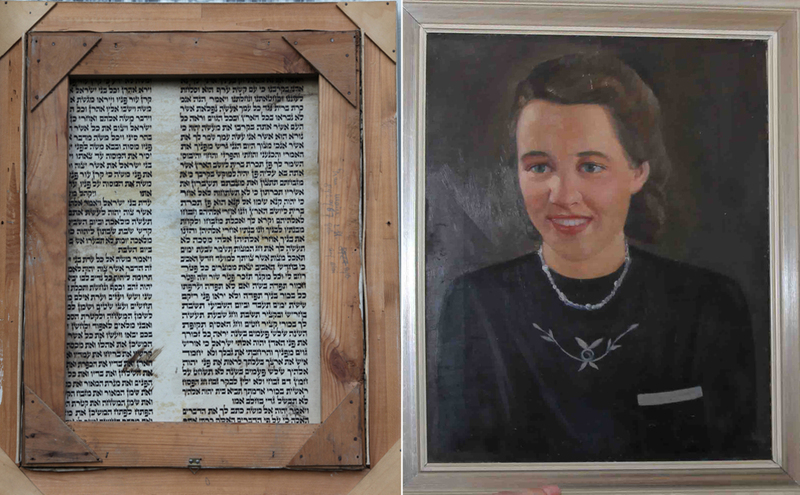 The origin and age of the Torah fragments bearing Mayer’s and his wife’s likenesses have not been determined, though it appears that the two sections came from the same scroll. Likewise, the precise date of the paintings is unknown. The identity of the artist also remains unknown, as does the question of how Mayer or the artist came into possession of the scrolls. What is certain is that the painter did not work from life, but from photographs Mayer provided him, which have been discovered among Mayer’s negatives and prints.